ExactFlat licensing supports floating licenses. A floating license allows the software to be installed on an unlimited number of machines, however the number of machines that can be running the software concurrently is limited to the number of licenses on the floating license server. Install a floating license server that is accessible to client computers. The installer can be downloaded from below. Reboot the server or manually start the RLM-EFServer service. ExactFlat licenses can be purchased as stand-alone or floating network licenses. A floating network license requires that a license manager be installed on a server that the client can connect to. This must be done prior to activating a floating license on a client computer. These steps are required only once after installing SolidWorks. Once the license manager is configured to use floating license, a license will be checked out as soon as SolidWorks is loaded. Please see Installing a Floating License Server. Ensure the ExactFlat Add-in is loaded. From the SolidWorks menu bar, select About from the ExactFlat Tools menu. Click on the License button. 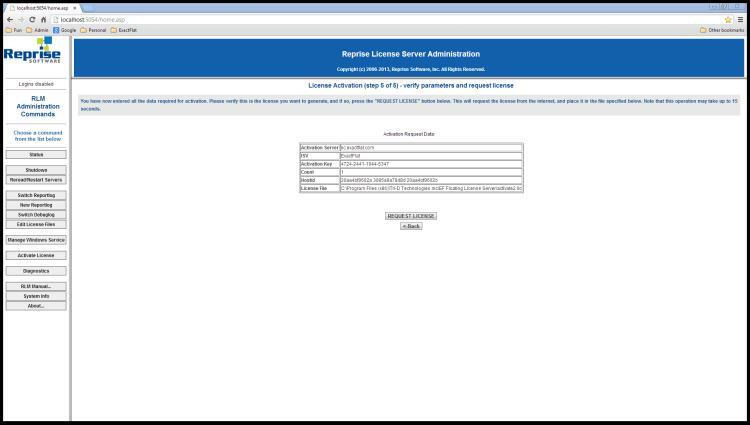 Ensure the license settings are configured for floating licenses. Click the Apply License button. A floating license will be checked out. ExactFlat will automatically search your network for the ExactFlat License Server. In some cases, a firewall may block license requests to the server. If this occurs, you will need to configure your firewall to accept incoming traffic on the ports used by the ExactFlat License Server. The ExactFlat License Server uses ports 5053, 5054, and 80. Right click on service name RLM-EFServer. Paste license activation key. If entered manually, include hyphens. The host ID for the license server is automatically entered. Enter the number of licenses to activate on this license server. Verify information and request license. Restart license server after license file has successfully written to license server. If you have problems with this process contact customer support.